Sports rehab aides assist athletes and individuals with sports-related injuries as they heal and recover. Whether it is working with a large sports organization or assisting student-athletes as they recover from injuries, physical therapy aides provide a variety of services that help athletes to be healthier and to train more successfully and safely. With an eye toward avoiding further injuries and returning the body to full functionality, physical therapy aides analyze their patient’s injuries and physical condition, identifying core issues such as flexibility, endurance, and even diet. Using this evaluation as a basis, they can begin organizing a treatment that satisfies each patient’s unique needs. What is a Sports Rehab Aide? When an athlete or individual has been injured during playing a sport or participating in some other athletic activity, it is necessary to do at least some physical therapy to strengthen the muscles and tissues surrounding the injury, and to prevent scar tissue from building up in the injured area. Simply doing exercises on one’s own could lead to further damage, which is why doctors will refer patients with sports-related injuries to a physical therapist, who will be assisted by a physical therapy aide or sports rehab aide. A sports rehab aide has completed training as a physical therapy aide and uses their classroom education in science and medicine, along with hands-on experience in medical massage and the use of physical therapy equipment, to assist patients in performing their rehab exercises. To become a sports rehab aide, you’ll want to begin by choosing a program. 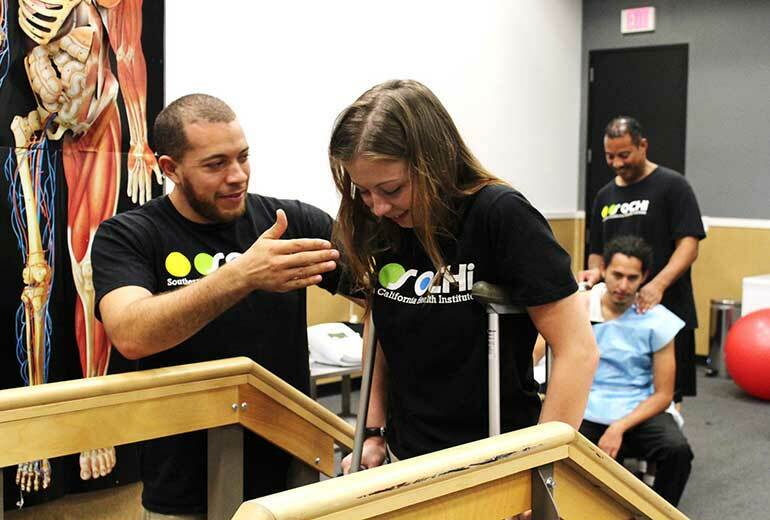 Vocational schools such as Southern California Health Institute (SOCHi), offer a comprehensive program that prepares you for an entry-level position in physical therapy and sports rehab. Coursework covers important science and medical subjects such as anatomy, physiology, and kinesiology, but it also includes important business principles and information to prepare you to handle the business and office aspects of being an aide. Not only does the physical therapy aide program offer you training as a physical therapist aide and sports rehab aide, but also in the modalities of medical massage. SOCHi’s program also teaches you how to use the physical therapy equipment, and the ability to customize patient’s workout to their individual needs. Once you have completed the training program at SOCHi, you can begin work immediately, assisting physical therapists and sports rehab professionals as they work with patients. Or you may be interested in getting further qualification by taking the MBLEX Exam and applying for certification as a massage therapist. California Massage Therapy Council (CAMTC) offers this certification to qualified individuals. Sports rehab is a career that is growing rapidly as more people seek the guidance that only a trained physical therapy aide or sports rehab aide can provide. The Physical Therapy Aide program at SOCHi offers you the well-rounded curriculum and comprehensive hands-on training you will need to properly prepare for success as a sports rehab aide. If you would like to know more about SOCHi’s Physical Therapy Aide/ Sports Rehab Program, feel free to request additional information. We would love the opportunity to talk with you.